I'm always looking for an excuse to make a cake. I like to make cakes. I just don't have anybody to eat them. Everyone knows that I have to restraint when it comes to dessert. If I make a cake with no extra people to eat it, I eat the whole thing. Call it gluttony. Call it pathetic. Call it whatever you want. I call it a problem. Any time that friends or family have guests from out of town, I want to make a dessert. So when my friend The Reader told me her sister was coming for a visit, of course I begged asked them to come over for dessert. We asked Reader Sister what her favorite dessert was. She said chocolate cake with chocolate butter cream. Do not make this cake if you are on the last dollars of your monthly food budget. The ingredients cost about $50. But if you have the money and the calories to spare it is a show stopper. I think it is a little more elegant looking with the ganache and the original recipe for Oreo Truffles calls for a chocolate coating rather than white chocolate - but Sister Reader wanted butter cream and who am I to turn down a request for that? We also much prefer white chocolate over the Oreo Truffles so I changed that up and a cake was concieved. I was really excited about this cake. Really. Excited. So I whipped up the batter for the cake as instructed (secret ingredients - milk chocolate chips, chocolate pudding, sour cream, and Oreos) and put it in the oven. I was a little concerned about the batter - it was really thick - so while it was cooking I looked up the recipe that Miss Swanky had adapted her recipe from. Hmmm, this recipe had 1 cup of oil in it, and looked much more like cake batter......Hmmm. I still had room in my mind for the idea that taking the oil out was an intentional part of the adaptation of the recipe. I put about half a package of chopped Oreos around the base and on top of the cake and then added the Oreo Truffles to the top of the cake. When you put the truffles on top you have to dip them in the chocolate so they will "stick" to the cake and mound nicely. When I did this I accidentally strung white chocolate over the cake. To cover this up I just slung more chocolate all over the cake. It looks like I could have used just ONE more truffle for the top....it still looked pretty good though...Just about the time I got everything finished I heard back from Miss Swanky and YES, the cake was supposed to have oil in it. She was very apologetic and kind and even offered to refund the money I had spent on the cake. I couldn't take her money, but she has some other talents (blog design) that she is going to share with me and I REALLY appreciate that! It actually tasted pretty good even without the oil. The texture was a little odd but it was not a disaster at all. The butter cream was OUT OF THIS WORLD GOOD! 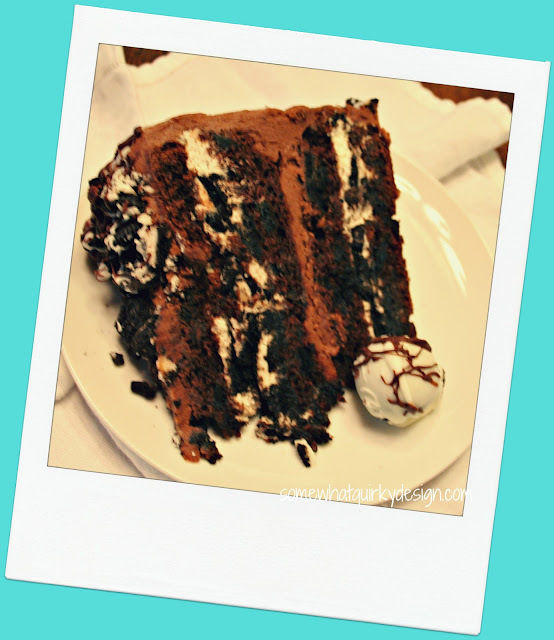 To get the recipe for the Oreo Cake and see the pictures with ganache topping check it out at Something Swanky. Also I know Miss Swanky corrected the recipe so you don't have to worry about that! The original cake recipe (no oreos) - which I will probably try someday soon - can be found here at kevin and amanda. 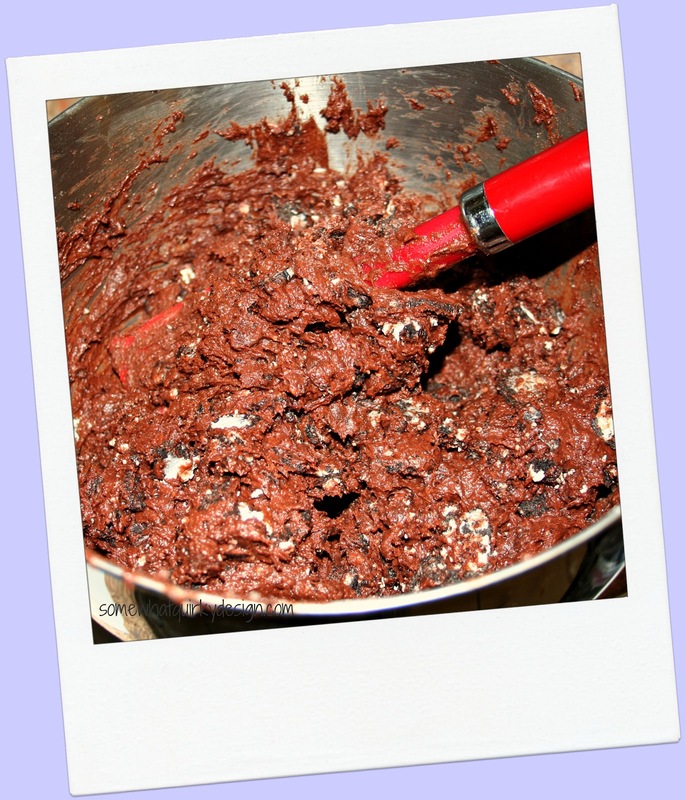 In the bowl of the electric mixer fitted with the paddle attachment, beat butter until smooth and creamy, 2-3 minutes. With mixer on low speed, add chocolate until just combined. Add milk, vanilla, and sugar: mix on medium until well combined, being careful not to overmix. And just in case you haven't been introduced into the heaven of Oreo Truffles this is how I make them. Grind oreos in a food processor. 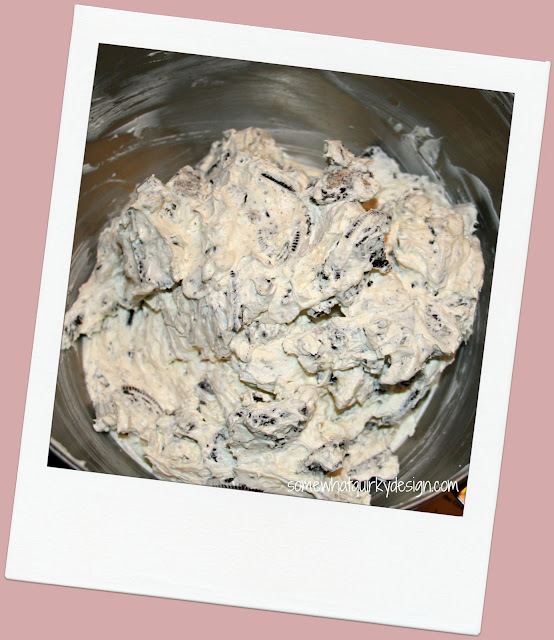 Cut cream cheese into chunks and mix into cookie mixture in processor. Listen to the sound of the processor - when it sounds like it is bogged down and getting ready to burn out the motor, turn it off. Take the batter out and put in the fridge for several hours. When batter is very cold, take it out and make tablespoon sized balls. I put them on a cookie sheet and then freeze them for several hours. Melt 1/2 package of white chocolate chips with one teaspoon vegetable oil for about 1 minute in microwave. stir until smooth and use to coat frozen truffles. Just pull out about 10 or 15 at a time or they will thaw and be more difficult to coat. It usually takes a couple of bags of chips to cover an entire recipe of truffles. I store them in the fridge, but they taste best at room temperature (if you can wait that long to eat them). Thanks again Miss Swanky for your help with this recipe. If you need to make an impressive cake - this is your cake. Go for it - but make sure there are about 16 people to eat it! Happy belated birthday Oreo Cookie! 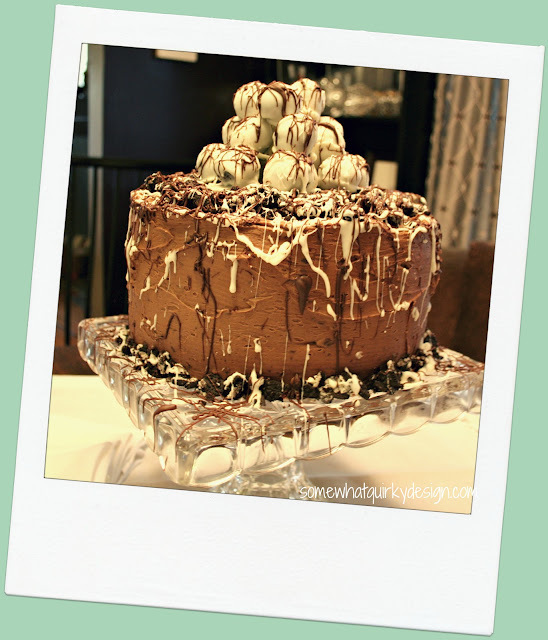 A cake like this needs a party! Love the changes you made! Looks so good :) And thanks for the link back!! This is an incredibly awesome cake! Wow, I'm amazed and impressed and my mouth is watering! BTW my birthday is next month! How wonderfully decadent that looks - I can't even imagine the calorie count. Maybe if I waited for the ingredients to be on sale! I will have to see how much lower I can make it for. Here from Cozy Home Scenes. Oh my! That looks so good and I'm a chocolate lover! Nice job! I bet this cake wouldn't look delicious at all to a person who just finished off the last half of a blackberry cobble with vanilla ice cream. Now let's see...who could that person be? Wow! This looks incredible! I'm pinning it! We share the same love for cake. 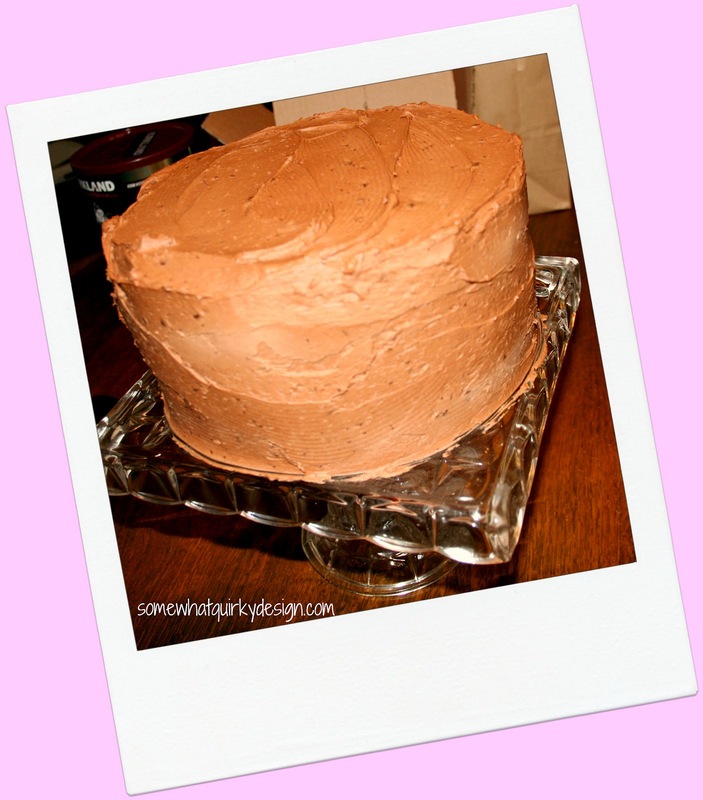 Chocolate cake is my favorite dessert too! You should have had me over, and I would have gladly helped you eat this. With that much chocolate, I'm sure you didn't miss the oil all that much. It sounds great! 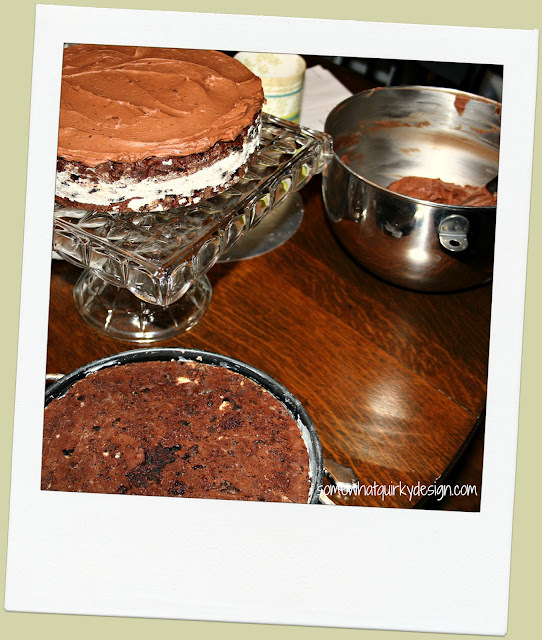 Thanks so much for linking up to Your Cozy Home Party! Oh wow! I think I am in love with your cake! Looks so gorgeous and delicious! I am a horrible cook, but I love to bake. Unfortunately, my husband avoids sweets so I don't get to bake. My daughter's birthday is coming up and I might just have to try that decadent cake recipe. There are no words... WOW!!! I'm visiting from Cozy Home Scenes! 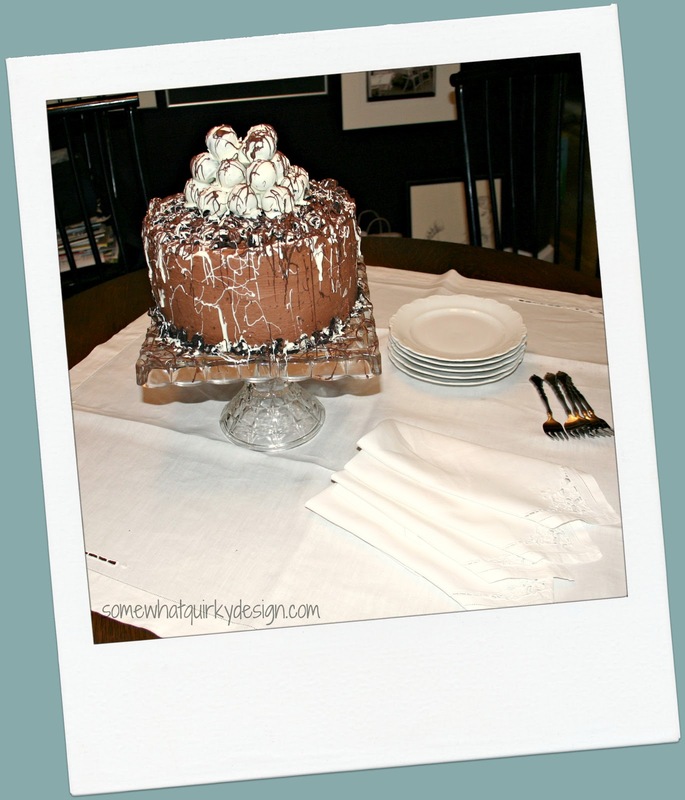 Your cake is a work of art and you should be so proud of it!! It sure looks good oil or no oil. My oh my!